North Carolina Penitentiary Annual Report of the Board of Directors and of the Superintendent of the State's Prison, for the Year Ending December 31, 1894. 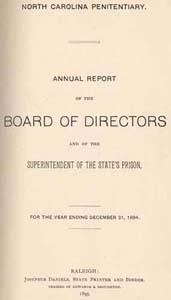 Annual Report of the Board of Directors and of the Superintendent of the State's Prison, for the Year Ending December 31, 1894. Raleigh: Josephus Daniels, State Printer; Presses of Edwards & Broughton, 1895. Juvenile corrections -- North Carolina. North Carolina Penitentiary -- Finance. Prisoners -- North Carolina -- Statistics. Prisons -- North Carolina -- Statistics. Work release of prisoners -- North Carolina.